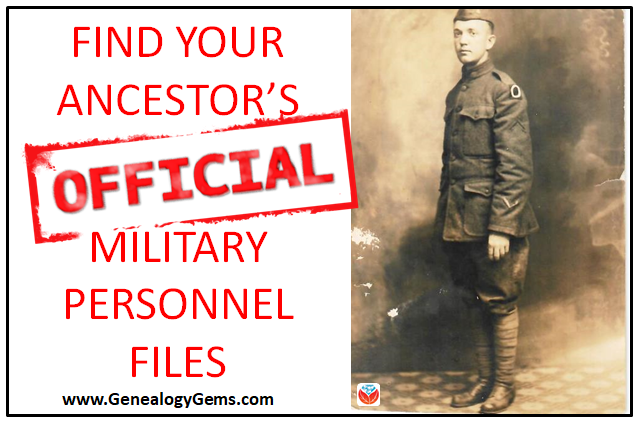 Military terminology for genealogists: What’s the difference between “regulars,” “volunteers” and “militia” in your U.S. ancestors’ military service records? It matters! Researching the records of each–and what you find–may be very different. Expert Michael Strauss explains here. If you’ve looked through your U.S. ancestors’ military records, you’ve likely come across terms like Regulars, Volunteers, and Militia. What do those terms mean? You’ll want to know because the records were different and so were their terms of service. Also, you may come across relatives who served in more than one capacity. Volunteers were men who served during wartime or any period of emergency whose service was considered to be in the interest of the Federal Government. Recorded from the Revolutionary War onward, these men at that time might also be listed early on as “Associators.” Not to be confused with militia, Volunteers were not subject to fines for non-service. Like the Regulars, records of volunteers’ service are also found at the National Archives. 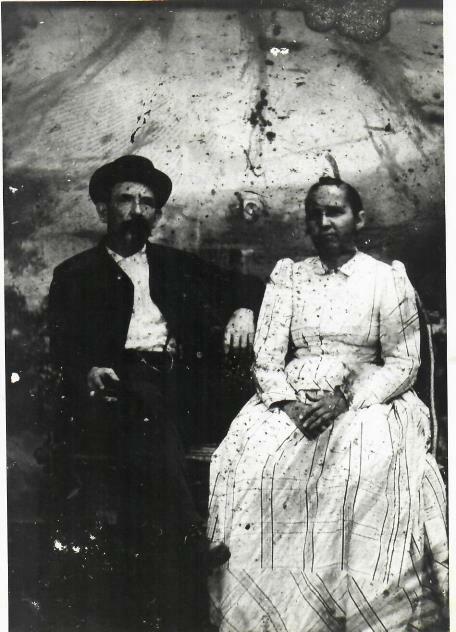 My ancestor, Samuel Howard, served during the Civil War. Because of his age he wasn’t able to enlist until 1865, when he turned 18. He was first a Volunteer soldier, who served as a substitute for another man who was drafted. 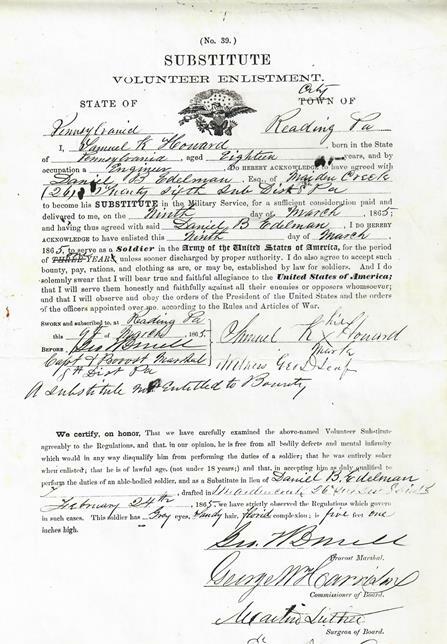 After his discharge, he enlisted in the Regular Army in 1866. He was assigned to the 13th U.S. Infantry, where he served one month before deserting at Jefferson Barracks, Missouri. Samuel was married in 1867 (this may have some relevance to his decision to leave the military). He lived in Pennsylvania from the end of the war until his death in 1913. He is shown here in this 1876 tintype photograph in Lebanon, PA. Both his Volunteer and Regular Army enlistment forms are shown below. The forms look very similar, as each contains common information asked of a typical recruit. However, they are decidedly different as the one covers his Civil War service and the other his post-war service when he joined the regular Army after the men who served during the war would have been discharged. 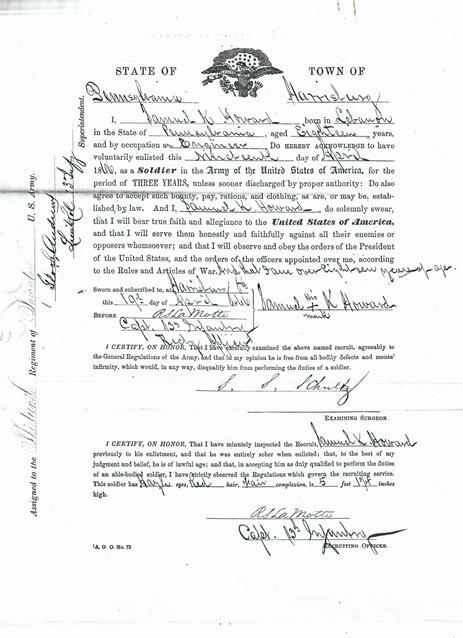 Take-home point for you: I believe the key to finding your ancestors, whether they served in the Regulars, were Volunteers or Militiaman, is to look at not only federal records but also search your state records. The latter may be the only place you find proof of military service. Samuel Howard’s Regular Army military service, although brief, was completely unknown to me until a couple of years ago. When he applied for his Civil War pension, which was granted to him, he never mentioned his Regular army service. 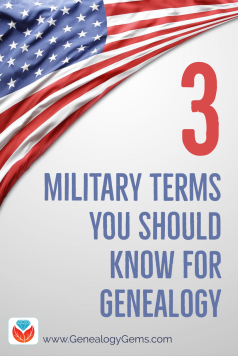 And keep learning more helpful military terminology for genealogists! Click here for resources on military acronyms, abbreviations, and dictionaries from the National Archives that can help that you research exactly how your ancestors served. Michael Strauss, AG is the principal owner of Genealogy Research Network and an Accredited Genealogist since 1995. He is a native of Pennsylvania and a resident of Utah and has been an avid genealogist for more than 30 years. 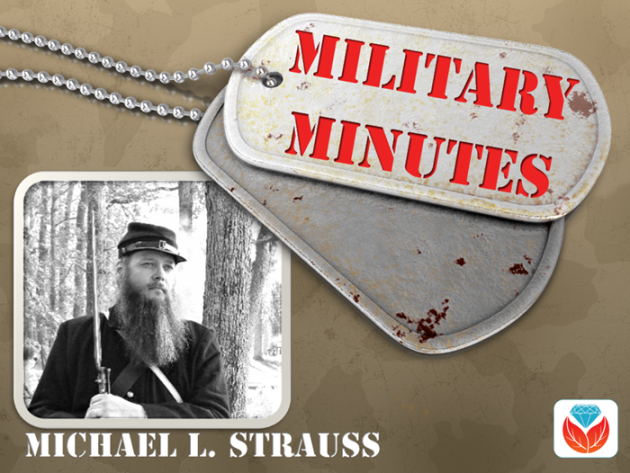 Strauss holds a BA in History and is a United States Coast Guard veteran.